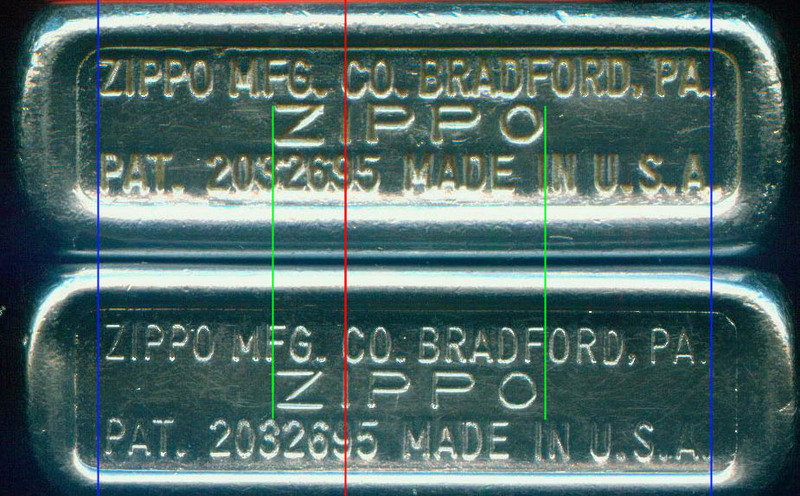 The date coding on Zippo lighters was introduced in late 1955, so lighters made after this date are very easy to identify. Earlier lighters are much more difficult to date accurately. I am going to start with the last undated lighter as this is the easiest to date. This lighter was made between 1953 and 1955 and is identifiable by what is known as the "Full Stamp". The base has three lines of text and is the only uncoded version to carry the Patent Number 2517191. This is followed by the registered trademark sign ® and the abbreviation "PAT.PEND". This stamp was introduced in early 1953 and continued in use until 1955. The lighters within this timespan can be narrowed down into two groups, mid 1953 to mid 1954 will have a chrome plated steel case, whereas lighters from mid 1954 until late 1955 will have a chrome plated brass case (In order to test this, place a magnet (wrapped in cotton to avoid damage) to the open lid of the lighter. 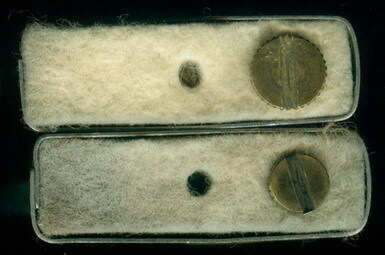 As the inserts may be steel, a magnet will stick to some brass cases if placed against the body of the lighter. I now want to go back to the first lighters made after WW! !, This was when the "Canned bottom" (where the base of the lighter is indented) was introduced, and all lighters made before this date had either a flat (1933-1942) or a round (1942-1945) bottom. These earlier lighters are quite rare and will be covered on a separate page. When writing this page I have used information from lighters that were engraved, at the factory, with either a date or a company logo with a specific anniversary. I have had to research the individual companies to discover the date the company was formed in order to determine the year that the anniversary was celebrated. Whilst being a good guideline, this is by no means infallible. Companies planning an anniversary celebration would start the planning and ordering the souvenirs a lot earlier than the date of the anniversary, for this reason a lighter engraved 1956, may have been produced in 1955. This is still evident today with many of the dated lighters. For this reason this page should be considered as a guideline only. 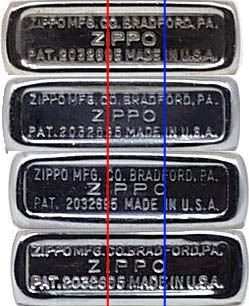 Lighters made before 1953 had the earlier 2032695 patent number and it is the placement of this number, along with the placement of the word "ZIPPO" that can help identify the date. Some important points to note are the shape of the "3" within this patent number, some lighters have a round top 3 whilst other have a flat top. Also look carefully at the placement of the word "ZIPPO". On the two lighters below we can see how the spacing between the letters differed over time. On the first lighter, ZIPPO starts between the 3 & 2, whereas on the second it starts between the 2 & 6. We can also see a difference in the spacing between the individual letters in the word ZIPPO. When trying to date these earlier lighters it is important that close attention is paid to the exact layout of all three lines. Looking at the two lighters above the red "base line" serves as a guide to the placement of the letters. In the first the base line of the "B" intersects the two "P's" almost exactly then intersects the "M" just beyond the midpoint. In the second picture the same line touches the end of the first "P" and misses the "M" completely. Throughout the rest of this page, these base lines will be used to compare the differences in the bottom stamp. Another difference worthy of note is in the design of the flint wheel. 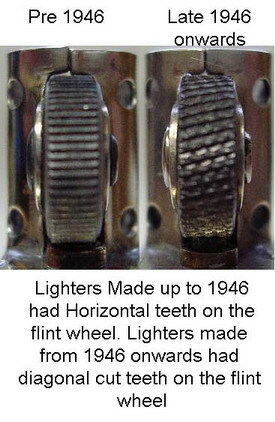 In the spring of 1946, it was discovered that many of the lighters being returned for repair were suffering from faulty flint wheels. A decision was made not to allow any more lighters to be shipped until this fault was rectified. Experiments were made using different types of steel and different angles of cut. Zippo spent $300,000 on this research. The result was that the former "cross cut" wheel was discontinued and a diagonal cut wheel was introduced. The next major difference is the hinge, between the two halves of the lighter case. Over the period 1946 to 1955, three different hinges were used. The early 1946 lighters had a three barrel hinge, where the middle barrel was longer than the two outer barrels, From late 1946 to 1949, the three barrels were approximately equal in length and from 1949 onwards a five barrel hinge was used. Some lighters made in 1946 also had the earlier 14 hole chimney. A 16 hole chimney was introduced in this year. One final alteration is the screw used to hold the flint spring, I have found 2 sizes of this screw, the most common is 6.4mm in diameter but there is also one that is 8mm in diameter. So far, I have only found the larger one on 1951 lighters. Another detail picture shows just how minor these differences can be. The two lighters below are both 3 barrel (Short Centre) hinged lighters, so can be dated by the hinge to 1946-1949. Again using a red base line through the "I" as a common reference point the two lighters appears identical, however when further lines are added (blue to compare lines 1 & 3, green to compare line 2) we can see that all three lines of text have shrunken very slightly, so, even in this relatively short time-span, two different bottom stamps were in use. It should be noted that the "stampable" area on the base of a Zippo is around 32mm (1¼ inches). In the image above this has been magnified 6.5 times. When comparing two lighters side by side this difference would be almost imperceptible to the human eye as the actual difference on line 1 is 0.7mm.